Are you a morning workout person? I most definitely am. Be it a walk or a yoga session at home or an hour of badminton, done and dusted before 8 am helps me start my day on an energetic note. If I don’t get it done in the morning, I find it difficult to muster that much energy later in the day. Not to mention the guilt that weighs me down for the rest of the day. There are people who hit the gym in the late evenings after a full day of work. I doff my virtual hat to you in admiration. With the workout done, can a good breakfast be far behind? What qualifies as a good breakfast? And by good, I mean healthy. Healthy is a very confusing term these days. Everyone has a contrary opinion. Here’s what healthy means to me - good for you and sustainable over a long term. The more complicated a healthy lifestyle, the more difficult it is to sustain it. A restrictive diet or a depriving one can only last that long. Especially when it comes to weight management, the drastic diets give instant results, but the results last only for as long as you can stick to the diet. Small changes to the existing lifestyle are easier to make and maintain. For example, starting the day with a healthy breakfast. A healthy breakfast is one that supplies the body with all essential nutrients. It should keep you filled up for a few hours while not being heavy to make you feel sluggish for the working day ahead. It is best if your breakfast (or any other meal for that matter) is free of refined flour, sugar and any other foods devoid of nutrients. Oats is one ingredient that helps start the day on a healthy note. It is affordable and extremely versatile. You can cook a dish from any cuisine, sweet or savoury, quick or elaborate. Oats comes loaded with dietary fibre that keeps you filled up for longer. However, what you add to the oats matters a lot. Adding sugar to make porridge oats or too much honey or dried fruit only adds to the carbs. Combining it with fibre rich or protein rich ingredient such as seeds, nuts or nut butters (in small quantities), yogurt etc. boosts the health quotient of the recipe. However it is a personal choice how one wants to savor the taste of the oats. 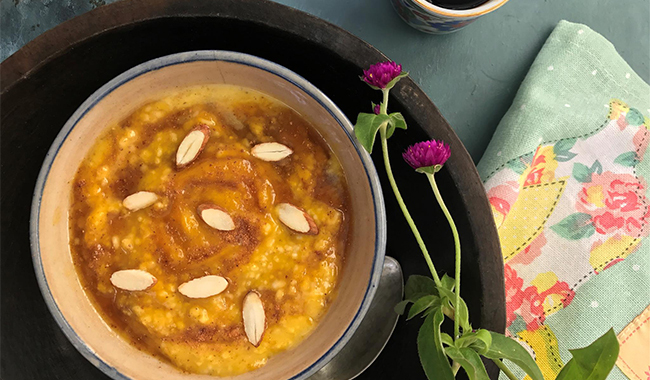 This recipe for pumpkin oats porridge has a balance of carbs (+ dietary fibre) from oats, more fibre and micronutrients from the pumpkin, fats and protein from the almonds and protein from milk. Add a tablespoon of ricotta cheese or peanut butter, and cinnamon to enhance the taste. Sweetener can be added if desired. This makes for a healthy and filling breakfast. 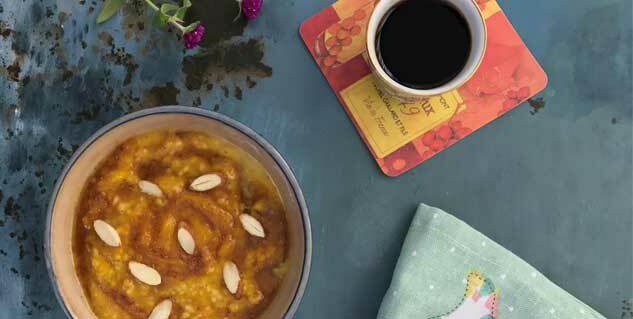 See recipe of Pumpkin Oats Porridge below. In a small saucepan, cook the oats in water for 2-3 minutes. Add the pumpkin puree and the milk and cook for 2 minutes. Sprinkle cinnamon powder and stir to combine.